M.O.R.E. invented the one inch body lift "Puck" over 13 years ago. With the need to keep increasing tire sizes and the new generation of flexible suspension systems, it has become a necessity to move the body away from the frame for increased tire clearance. One inch doesn't sound like much, however in most cases it will give you the extra clearance you need, without making your Jeep® look like it has a body lift. Our "Pucks" are made out of 6061-T6 aluminum. Were talking about aircraft quality stuff here! They will not crush, break or slip around once bolted in place. Natural aluminum color looks great under your rig. No plastic to break or look "cheap". BODY LIFT "PUCKS" are available separately if you want to make up your own body lift. 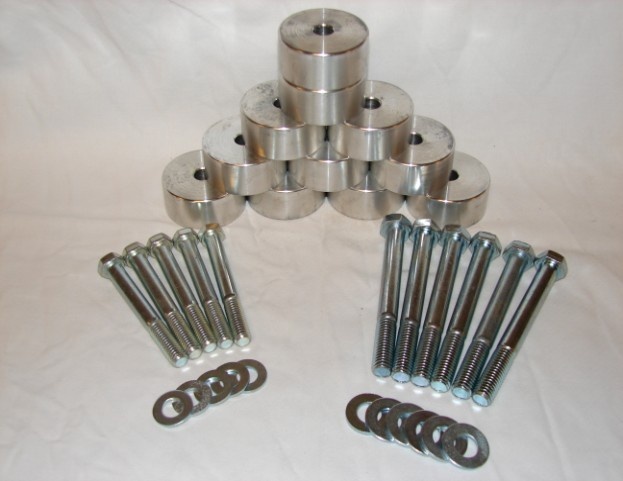 BODY LIFT "KITS" consist of enough "Pucks" for your Jeep®, longer grade 5 bolts, flat washers, misc. brackets and instructions.